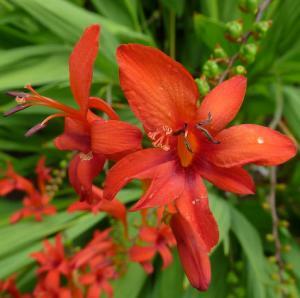 Crocosmias, commonly called Montbretia, are corms which form dense clumps of upright sword-shaped foliage. In mid-summer this makes a good background for the sprays of bright, usually orange flowers,carried in branched spikes. It is ideal for growing in swathes through the herbaceous border and the flowers are excellent for cutting. 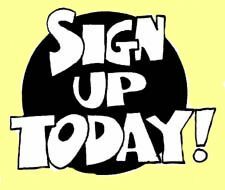 In very cold areas, the plants need a sheltered site and the bulbs should be lifted and stored over winter. 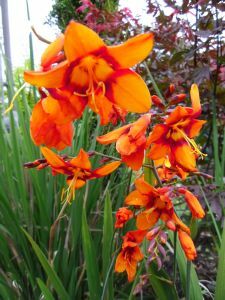 The compact variety Crocosmia ‘Emily McKenzie’ flowers in late summer, its large, bright, slightly burnt orange flowers having a mahogany throat. The sword like foliage in this variety is olive green. 50cm tall. 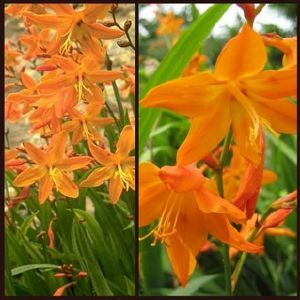 The original Montbretia was bred by the French plant breeder Lemoine who was best known for his Lilac and Peony hybrids. From1880 onwards, Crocosmias or Montbretias as they were then known, filled the gardens of Victorian and Edwardian Britain. From it were bred short, grassy-leaved forms, including the dark-leaved Crocosmia `Solfatare' (now Crocosmia x crocosmiiflora `Solfatare'), which appeared in literature before 1897. 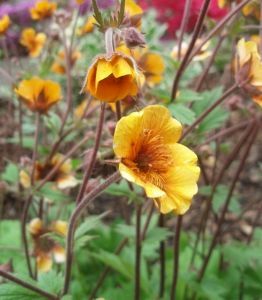 This plant thrives in frost-sheltered western areas, but is not truly hardy and needs plenty of moisture. It is not a vigorous garden plant, despite its Award of Garden Merit. 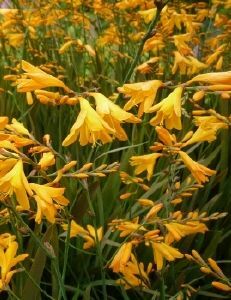 Crocosmia crocosmiiflora ‘Gerbe d’Or’ (Coleton Fishacre) on the other hand, has very similar attributes, dark olive green foliage and deep apricot flowers, but is a much more enduring and hardy variety in the garden. 60cm tall. 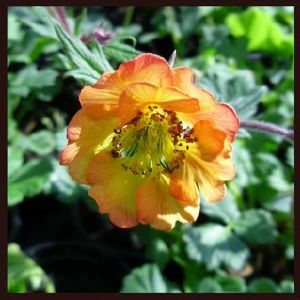 Geum 'Hannay's' (Double) is a compact perennial forming a neat mound of dark green foliage,with coppery-orange double flowers in early and mid-summer. It flowers best in full sun and will cope with dry soil.